I am trying to set up FlightGear as follows. I have dual monitors. 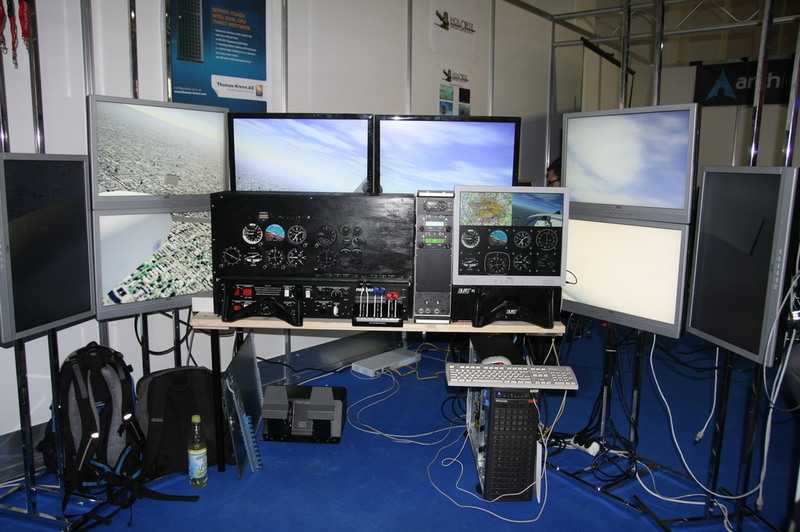 In MS FSX I like to use one monitor (the smaller of two) as the instrument panel. The other larger monitor I have as the view outside the cockpit straight ahead. (IE: I have a dedicated instrument panel and do not want to span across with the outside view, or the instruments.) I do this by undocking the instrument panel and moving to another screen and then resizing and full screening in MS FSX. I see the code I need to put in and where in relation to the tags. I do not know how to edit the file to do what I am looking for though. Every example I find spans across multiple monitors (with both inst and outside view). I want my instruments separate from my outside view. If anyone has done this successfully I would greatly appreciate the code. Having a look at the sim, I am basically after cockpit view without the instruments showing on one screen and maybe 2D cockpit showing only on the other screen. Something similar to that. I am using Win 7 64, nVidia GTS250 and nVidia 6150. I can connect the monitors both to the 250 or leave them on separate video cards, either way is fine if someone can help. Any help appreciated as I like the way this sim runs (smooth) and the flight physics feel more real to me. I haven't flown in a few years and have GFPT (Australia). I am about to go back and get my full PPL and really like using sims to reinforce procedures. did you ever find a way to do this? Thats what I want too! Rules are made for the guidance of the wise and the blind obedience of fools. This becomes ever more interesting since I purchased a 32" HDTV Monitor. So, is there multiple monitor support in FG? OK, now I'm certain that FG supports multiple monitors and views (at least in Linux/Unix). This photo is from the FlightGear Newsletter May 2011. About 3/4 of the way down the page under the heading, LinuxTag 2011. Now all we need to know is how to configure multiple monitors and views for Windoze. Wow, I am sooooo envious. https://gitorious.org/fg/fgdata/blobs/master/Docs/README.multiscreen (also in your FG's Docs/ directory). I get what you are saying about a strong computer. As it stands, running multiple programs along with FG (including VLC streaming video) with two monitors has been OK. I suspect I will get a little hesitation from time to time, but I'm willing to chance it. Thanks for the links. It seems like all I do is study since I installed FG. Still, this is BIG fun. Thanks again!